Cable rings are uniquely styled and creatively made to fit the style of the modern man. 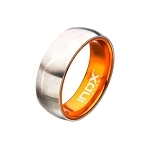 Rounded with beautiful looking titanium, they give off an edgy, urban look that will make you stand out. Ideal as a fashionable accessory, or a wedding band, these options provide several different uses. Hip and creative, our selection is full of incredible choices. Available in slick black titanium, or timeless stainless steel, we have many great looks that you will enjoy. 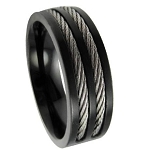 The best part about our men's cable rings is that they’re all easily affordable to you. This style isn’t for everyone, but if you’re looking to try something new and unique, it could be just what you’ve been looking for. We have many great choices in black and silver that are unlike anything else you will find online today. Our materials are strong and durable and engineered to provide the perfect fit for you. Not all men are used to wearing a ring, so it’s extremely important to find a comfortable fit that they can wear every day. All of our men's cable rings are bold and functional to take anywhere you go. You won’t have to worry about taking it off and potentially losing it. Whether you’re buying it for your own unique style, or for a wedding band to go with your special someone’s ring, we can help you find something that is really for you. Our team is committed to finding something that represents your unique style and personality. Once you browse through all our choices, we’re confident you will find something that catches your eye. Our options are affordable, durable, and high quality when compared to other items at the same price point. If you have any questions we can answer, please contact us right away.